Exactly one year ago, I completed all 26.2 miles of the Chicago Marathon. Three hundred and sixty five days later it still feels a little surreal that I actually accomplished such a monumental goal. I came to realize that I was disappointed because I had expected running a marathon to be a transformative experience, and I felt like the same Layne. Little did I know what an impact it actually would have on me. One year later, I feel like a completely different person. I learned so much about who I am by running alone (no music) for a few hours every week during training. For me there is no better way to soul search than to hit the road and just be inside my head, alone with my thoughts. 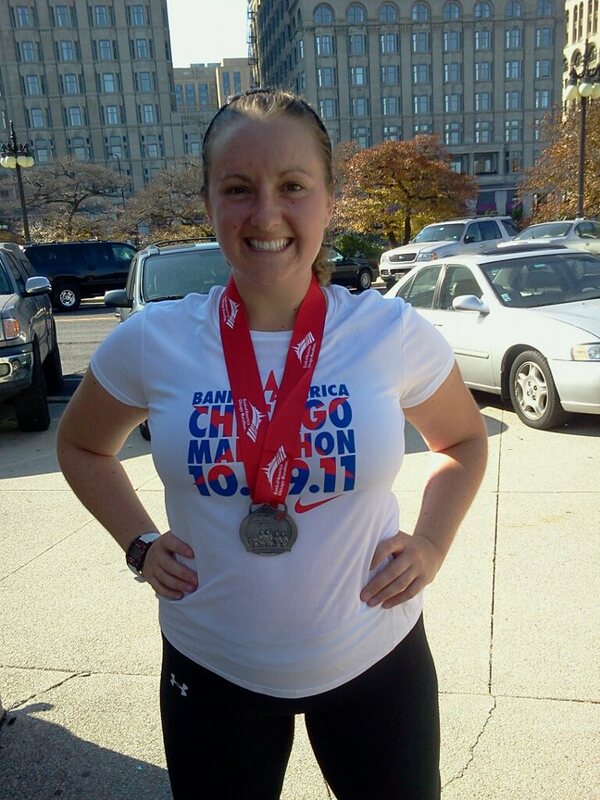 Being able to call myself a marathoner gave me a huge boost of confidence. I know that I can tackle anything because I am capable of hard work and perseverance. Probably most importantly, the marathon was the catalyst for me to take responsibility of my body and make fitness a priority. When I started running as a New Year’s resolution I had no idea that I would go to Grad school for Exercise Psychology, work on a research project combating childhood obesity, become a group fitness instructor, and be teaching 125 students about lifetime physical activity and fitness, but here I am. Sometimes it takes time to see how an event affects you. I wish that one year ago, I would have known the impact that running a marathon would have on my life. I can say without hesitation that it was ABSOLUTELY worth all of the time and hard work I put into it. This entry was posted in Run for Fun by sparklesandsweat. Bookmark the permalink.